Any suggetions for an easy install? My wing already has a passenger backrest installed. I have a Shad Box. It has served me well for many years and I like the fact that you can buy another mounting plate to put on another bike or scooter then just transfer the box from one to another. I had to remove the undercover of the luggage rack and there are 4 drill holes to drill through the top of the cover. Then bolt the mounting plate on the scooter. I think you may have to remove your back rest to open the box. Givi also makes great boxes too and have more dealers or vendor carrying them then the Shad Box. You can go into the search engine in this forum to read and show you how to remove the lower cover of the rack too. Good luck and enjoy your ride. A Givi box on a Givi rack works in conjunction with the Givi backrest so that the box opens fully in spite of the backrest. From what I've gathered from this forum, the pillion backrest could cause a slight problem. The box will probably have to sit further back on the mount. I want to fit a larger box on my SW but I don't want too much overhang at the rear. My topbox already obscures the rear light and indicators from a high-seated vehicle, i.e. a van or lorry. I guess it will be a compromise of box size and overhang. Incidentally, I have my box mounted on rubber door stops, (the type you screw to the floor) with nuts and bolts holding it to the sissy bar mount. This way you can secure it without it being rigid, remember to use locking nuts. Check out more of this forum to discover other possible obstacles and solutions. I want to fit a larger box on my SW but I don't want too much overhang at the rear. My topbox already obscures the rear light and indicators from a high-seated vehicle, i.e. a van or lorry. I guess it will be a compromise of box size and overhang. How do you come to that conclusion? 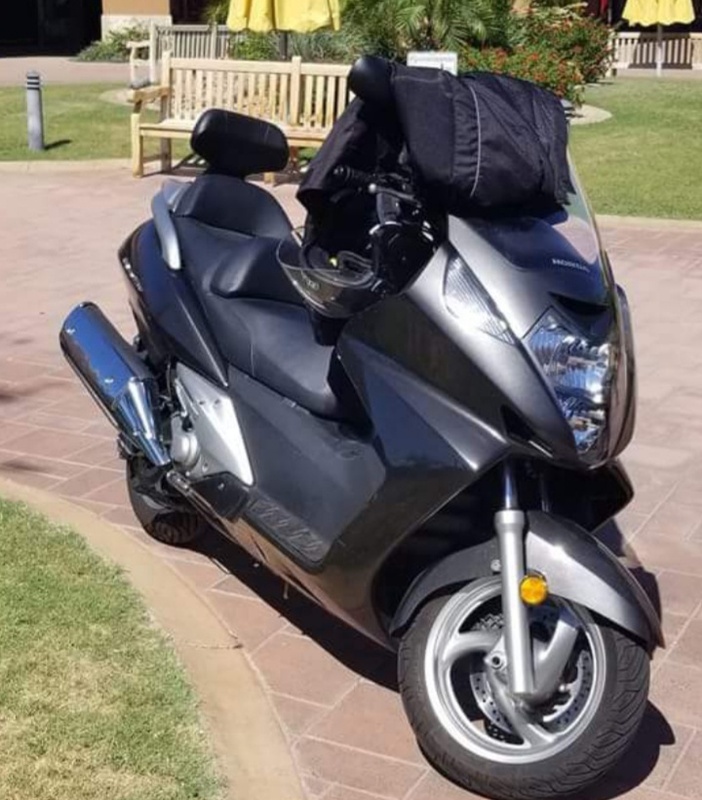 Your box is what size, 45 or 47 litres, I used a Givi E52 for a couple of months when I bought my Silver Wing in late 2010, then I had the larger Givi E55 permanently on until I sold the scooter last October. Neither top box obscured anything, and I used to ride over the pitch black A66 Pennines section at night on one of the most heavily used main trucking routes in the country. That E55 top box is now on my Forza and the rear lights and indicators are now LED. In fact this is the first time I've read anything about top boxes obscuring rear lights and indicators from HGV's. to the sides of the case and wire them into the same harness. I've put them on the sides of my new V56 box. Now I have very clear turn signals and wrap around flashing brake lights. 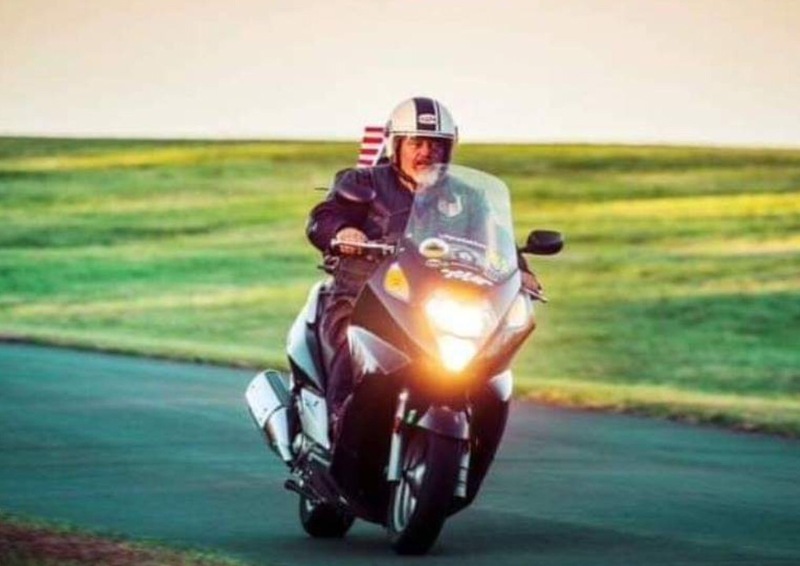 1 note: the harnesses that include brake lights and turn signals do not send power thru the mount the way that the standard GIVI lighting system does. Its a completely different thing you will have to unplug to remove the case from the bike, but its not hard. 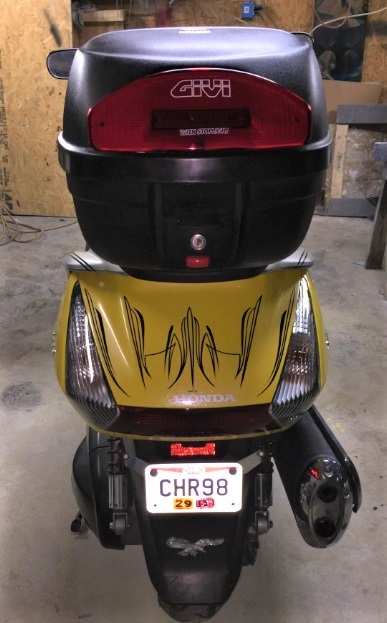 The reason is that the bi-color lighting system with turn signals requires more wires than the basic GIVI brake light. Also admore stated that the contacts on the standard GIVI setup did not last as long/were not as reliable. The admore system is a much more positive contact connection. Maybe I should elaborate. I noticed when standing close behind my SW that the rear light and indicators were obscured by the top box. If a large rig or lorry was driving close behind me, my rear light and indicators might be out of view, including the brake light. A small point I admit, but I would hate the excuse for a truck rear-ending me to be....oh, I didn't see your brake light ! Just wanted to throw my two cents worth in... if you've not made any decisions yet... the box I've used over the last nine or ten years has been the "cheapie" Bestem 929. Don't even remember the specs on actual size other than it's one of their larger models. Not fancy (unlined) but was black to match my SWing, came with a proper (for the bike) mounting bracket, kept things dry and had a decent enough brake light in it (that should always be visible by trucks). So, if you'd like, Google "Bestem" to see what they've got. Good Luck. 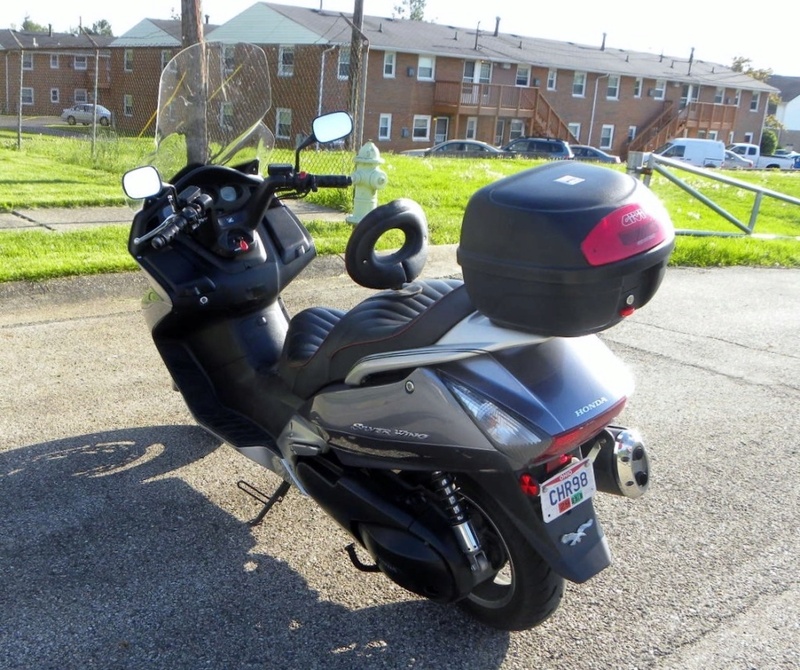 I used the Givi E26 Monolock which I picked up on ebay for $25 plus shipping. Same 2007 Silverwing just different paint. As recommended above---Givi rack/Givi back rest/Givi rack. My Givi E-46 model has just passed 600,000 miles, 1998 made. Givi stuff fits SilverWing well. My E-46 box served well on 2 new SilverWings, modified with hole in top for dog's head. With SilverWing gone, solid (bolted) to rear wing of new Kymco Xtown 300i. This box been on other bikes/scooter, too=always worked. I'm surprised anyone asking about accessories for Silver Wings on forums, especially as it was sold virtually unchanged for 16 years and most of the stuff for it has been around for years too. It's all out there on the Internet all you have to do is make the effort to Search. Likewise the umpteen previous topics and posts about buying and fitting top cases that are already here on silverwing600, and have been for years. In contrast my 2018 for 2019 Forza 300 has only been on sale for 6 months, and in that time accessories have had to go from design, development, and then to manufacture. I got my Forza in October and using the resources at my fingertipswithin a month I'd bought the new Givi rear rack for it from Italy so I can use my E55 top box. I bought plastic Puig hand guards for the Forza from France soon after that, and my new just on the market Givi D1166 ST higher screen was delivered yesterday from a UK seller. Online I've found other screens available by Ermax, and Hero. I chose Givi simply because they're widely available and their website kept me up to date. Unlike Puig who also have a new Forza screen available but no photos of it on their website to compare with the others available. I'm happy with the Givi it's a very nice looking screen, and when it's fitted the extra height and width will be very useful, especially as I can raise or lower the screen electrically. I sometimes think about how easy stuff was in my earliy riding years when dealers and shops had all this stuff in stock for you to touch, smell, and measure it up on your bike which was parked outside. However, the internet, and this forum, have mostly everything you need to get it right. It takes time and a bit of studying but that's the fun in making sure your SW works for you. For me, the SW has so many facets for simple 'customization' but then I'm biased !